Elizabeth Gilels was a Russian violinist born on September 30, 1919 (Heifetz was 18 years old and would live another 68 years.) Though she was a brilliant violinist in her own right, she is best known for being the wife of violinist Leonid Kogan and the sister of pianist Emil Gilels. She was born on the same date as David Oistrakh, though eleven years later. Gilels began her studies with Peter Stolyarsky, who also taught David Oistrakh and Nathan Milstein, among others. She later studied with Yampolsky in Moscow. Early on, she formed a duo with her brother Emil before taking a third prize at the Queen Elizabeth competition in Brussels, Belgium, in 1937. After the Second World War, she formed her duo with Leonid Kogan, whom she later married. From 1966, she taught at the Moscow Conservatory. 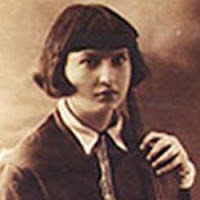 Some sources state that Ilya Kaler and Stefan Jackiw studied with her although they actually studied with Zinaida Gilels, Elizabeth Gilels' niece. She also wrote a method book on scales and double stops in the style of Carl Flesch. She died on March 13, 2008, at age 88, in Moscow.